Exciting because we’re getting really close now. Frustrating because the internet service is really terrible here at Harrah’s. I tried to blog last night but I only connected for about 3 minutes before it cut and and didn’t come back until 11:55am! Ah!! But at least we’re still on 200 days to go! Hopefully I will have internet tonight for 199! Looking at the news today, it seems that the weather in the lower Mainland is a pretty big deal, along with the fires in the interior. They are a really big deal. It seems more than a little crazy. I’m sort of sad I’m missing the storms in Vancouver, they look like they’re amazing to watch! OK, as for Olympic news, there doesn’t seem to be much happening, so I thought I would post something on Bobsleigh, it’s history and what the competitions will be at our Olympics. I found the below information at the Vancouver 2010 website. You can also look at the Federation Internationale de Bobsleigh et de Togogganing (FIBT) for more detailed information on bobsleigh. “The three Olympic sliding sports are bobsleigh, skeleton and luge. All three grew out of the practice of using a sled or toboggan — a light, narrow wooden platform on runners — to slide on snow or ice. In winter, using a sled to travel and have fun dates back some 700 years. The idea of racing sleds down a steep and twisting track dates back about 150 years, to the mid-19th century, when British tourists began tobogganing on the snowbound roads of the Alps. The four-man bobsleigh was on the program of the first Olympic Winter Games in 1924, in Chamonix, France. The two-man bobsleigh event joined the Olympic Games program in 1932. Women began competing in bobsleigh for the first time in 2002, at the Salt Lake City Olympic Winter Games. Today’s bobsleigh is built to be fast and aerodynamic, with a rounded fibreglass nose and four highlypolished steel runners. To start, the racers push off as fast as they can for approximately 50 metres, then jump into the bobsleigh for a seated descent down the track. The driver steers down the track, while, at the end of the run, the brakeman stops the sled. There are three Olympic bobsleigh events: the men compete in two-and four-man bobsleigh and women in a two-person format. 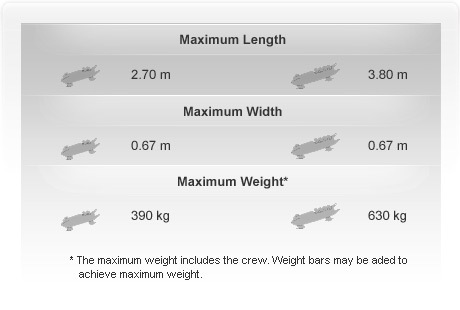 Here are the limits on lengths, widths, and weights for a bobsleigh (from Federation Internationale de Bobsleigh et de Togogganing (FIBT). ← 201 days to go – City Centre Station Opens!